Perhaps it was just a hunch or a lucky guess. Or, perhaps it was God's subtle guidance that led Guthlac to come to the conclusion he did about the man giving him a shave. Maybe it was a combination of subtle, unconscious signals--the way the man held the razor, the movement of his shoulders, where the man's eyes focused as he talked, and the pitch and timbre of his voice--but Guthlac knew that the man was contemplating a heinous act even as the man held a razor mere inches from Guthlac's throat. Perhaps Guthlac had seen that murderous look before in the eyes of his enemies or even his allies. Regrettably, he had indubitably known what it felt like to silently plot the destruction of another. Guthlac kept his hands at his sides and looked his would be killer in the eyes before asking, "You would kill me even as I sit here?" The man's face must have shown his shock, not at being accused of some surprising evil but rather at being found out. Guthlac made no move to stop the man who paused with death in hand--after all, Guthlac had had his share of fighting and was interested in fighting no more. The would be killer nodded lamely and produced a tearful confession before begging Guthlac's forgiveness. Guthlac forgave him instantly and taught the man about the Adversary's way of tempting us to destroy life--a lesson Guthlac was exquisitely qualified to speak upon--even as the man finished Guthlac's shave. Guthlac had left his father's home at the age of fifteen to pursue a life of what he thought to be freedom and liberty and would only later discover to be a type of self selected slavery. Raised in a noble family with prestige and influence, Guthlac was afforded with opportunities to gather around himself both friends and dark desires. He left his home with sword in hand and armor purchased with his family's wealth. Guthlac assembled around himself a band of followers and soldiers who would join with him in pursuing gratification and dominance by the work of their sword arms. They made war upon the people around them and took in spoils and profit at the expense of those who could least afford it. Everything they wanted--no matter how large or small--was theirs for the taking and in this way they sought after happiness. Yet, after nearly nine years of such a life, Guthlac was rapidly approaching the realization that his "freedom" felt peculiarly like slavery and his "liberties" felt like chains. One night Guthlac had a dramatic vision of the Lord Jesus while he slept and in that vision his perspective on life was changed and a seed of love and compassion was planted within his heart. A short time later, Guthlac could no longer deny the sin he had done in the pursuit of himself and so he laid down his sword and all its weight to pursue a path of love and compassion. Guthlac sold his things, bid his companions farewell, and became a monk at Repton in Derbyshire. Having forsaken his life of self obsession and violence, Guthlac devoted himself with the same passion to dwelling with and abiding in the God who had called him out of sin and into true freedom. After years of study, prayer, and growth, Guthlac asked for (and was granted) permission to become a hermit and further devote himself to the Lord he had met as a child but had only returned to in a tent and bedroll purchased with blood money. Guthlac moved to a place known as the Fens and built a hermitage for himself in its bleak setting. At first, the only ones who came to see him were his persecutors who hoped to gain any of his meager possessions through violence. Guthlac was beaten repeatedly and refused to harm his persecutors, choosing rather to pray for them. Guthlac knew well what their lives were and where they were headed, there were few better to pray for them.Eventually, his hard earned wisdom and spiritual maturity caused pilgrims to seek him out and ask for his prayer and guidance. One of these pilgrims would be the man who nearly murdered Guthlac with a razor so that he could move into Guthlac's cell and perpetrate a great lie to receive the esteem of other pilgrims. The same man--now a disciple of Guthlac--was there when Guthlac became ill suddenly and passed from this world after struggling with sickness for eight days. 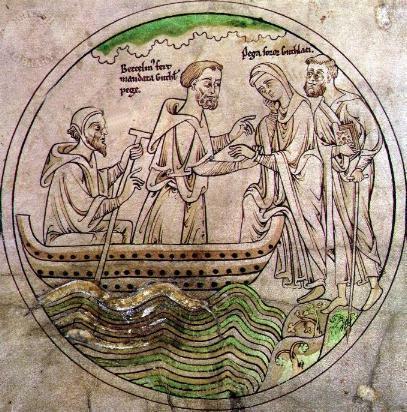 Guthlac left this world and its trouble behind on April 11, 714.